Sorry for the long absence ~ I had to replace my computer and had lost quite a chunk of my work thinking I had saved it but actually did not :( On the brighter side I am trying to extract and playing with camera settings a bit ~ if you have any suggestions on how best to set your camera for pictures for extractions please shoot me an email or just leave a comment I would appreciate it immensely!! Here is another attempt ~ Click on the preview to download CU OK. Thanks a ton - these are great!! 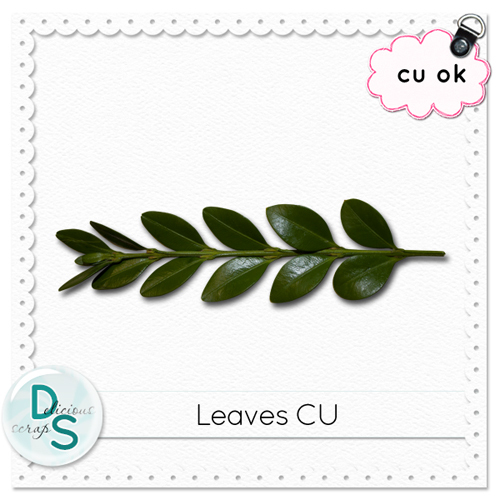 These leaves look great, thanks for sharing them with us! Thank you very much! Gorgeous element! Thank you very for this beautiful branch !! I have no idea how to set a camera for better extractions (if this is what you meant :S ) but this would be (very) enriching to know ! My hard drive went to the cemetery last week too !! Isn't it the marriages'season ?! I'm not a designer and YOU probably know this but just in case. I've noticed that a neutral background is more appropriate to extract objects. Example : I extracted a red bus photographed on an orange background and though i did my best some orange remained on the edges. Take care of a white background for metal like inox, chrome or bright aluminium as one can't see properly the edges always (yet ? )because of the reflection. And possibly no black background. Thank you so much for this post. I want to let you know that I posted a link to your blog in CBH Digital Scrapbooking Freebies, under the Page 2 post on Jul. 20, 2011. Thanks again. Thank you so much for this post. I want to let you know that I posted a link to your blog in CBH Digital Scrapbooking Freebies, under the Page 1 post on Jul. 20, 2011. Thanks again. and i also have no idea how to set my camera/ set up the photo area to extract. if you ever learn any valuable info please do share! i think you're doing a great job! =) thanks again!